This week's episode was recorded LIVE IN PORTLAND, OREGON! The first case is "Brown vs. Hoard of Vegetation." Then, Carrie Poppy and Ross Blocher of OH NO, ROSS AND CARRIE join the stage for Swift Justice! They help the judge rule on cases regarding card game rules, taking photos of a sleeping friend, and being called by the wrong name. Plus music from Máscaras! With Special Expert Witness Alton Brown! Stephanie brings the case against her partner Jeff, who works as a chef. Jeff will often leave his smoky and bacon-y aprons and detritus in his car. Stephanie thinks that the car should remain neat and clean; Jeff says the mess is manageable, and comes with the job. Who's right? Who's wrong? We premiere a new segment this week, Status Conference, plus a dad goes on trial. Marc brings the case against his wife Polly. They had a beloved dog who passed away several years ago. Marc would like to assemble and prepare a display of the skeleton in memory of their pet. Polly thinks this is weird and gross. Who's right? Who's wrong? 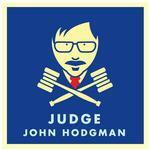 Podcast: Judge John Hodgman: Do You Want to Hoard Some Snowglobes?